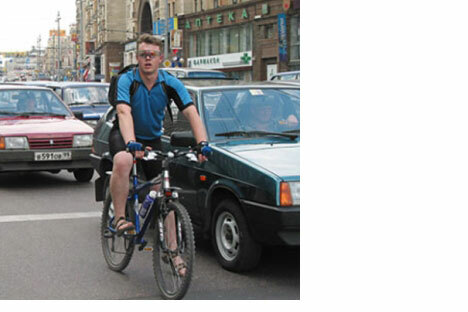 When will Muscovites switch to bicycles? Spring has come to Moscow. As usual, Mayor Yuri Luzhkov has suggested local residents start getting around the city on bicycles. He does this every year. No one is surprised and no one reacts. The man has a dream - let him dream. Dreaming, as the Russians say, does no harm. Of course, the mayor is not dreaming just to dream: he wants to alleviate the horrendous traffic jams for which Moscow is notorious. But on the city's streets there is a separate, even parallel life that has long since become entrenched. Muscovites make each other's acquaintance in traffic jams, swap telephone numbers and CDs, watch television and work at their laptops. Television news shows are forever reporting that yet another Moscow millionaire has successfully delivered his wife's new baby while stuck in traffic. Births in the back of gridlocked cars no longer surprise anyone. The baby was born healthy, thank God, so now let's get on with it. If, of course, we can. A person may live half an hour from work, but that means nothing. At rush hour, the drive will take two hours at best; at worst, it could stretch to five. Muscovites may be used to these jams, but they have not made peace with them. If you happen to hit traffic while going somewhere in a taxi driven by a local, he will tell you exactly what he thinks of the city authorities and what he proposes to do with them. Local papers keep coming out with articles that scream: "How Much Longer Can We Bear It? The City is Suffocating in Traffic Jams!" Indeed, if nothing else is going on in Moscow and there's nothing to write about, you can always write about the traffic problem and ways to solve it. People will read your piece with consuming interest. The city authorities read the papers too, of course, and periodically try to do something to combat this evil (the traffic jams, not the papers). They repair roads, they build new ones. In recent years Moscow has come into a lot of money. Tunnels are under construction here, roads are being widened there. Meanwhile, city residents too have had unprecedented access to money in the form of cheap loans. Now everyone - from students to pensioners - is behind the wheel. The number of cars in Moscow has grown geometrically. And now, no matter how wide the roads - and some are so wide an Airbus could land on them - none are wide enough to let all the cars pass. Last summer the papers turned apocalyptic: "A Few More Cars and Moscow Will Be One Giant Jam!" Then along came the crisis. Suddenly the mayor's dream of everyone riding bicycles seemed to get a second wind. Now those cheap loans are a thing of the past, and Muscovites are trying to spend less on gas and even public transportation, you would think they might contemplate switching to bicycles. But no. Luxury cars, it turns out, are selling like hot cakes in Moscow. Cadillac and Jaguar are doing twice the business they were last year. Rolls Royce sees Moscow as one of its most important markets. Ferrari, too, is counting on the Russians. So while Luzhkov dreams of Mucovites on bicycles, the Italians see them getting around in Ferraris. The financial meltdown has manifested itself in strange ways in Russia: people with the means seem to be rushing out to spend their last roubles on showy conveyances. And yet, bicycles may still stand a chance. They have recently come into fashion in Russia - especially expensive models with state-of-the-art extras. Experts maintain there are more mountain bikes in Russia than in any other country in the world. True, Russians use them exclusively for getting around cities. Don't ask why.